We believe Colorado Springs is a great place to recover from substance use disorders and find freedom from addiction! This event will celebrate our successes as a recovery community, put a face and voice to recovery from substance abuse disorder, and reduce the stigma that so often surrounds the disease of addiction. We anticipate over 500 people will participate in this event. We will have live music, speakers, games and contests, a "kids zone" full of activities and prizes, great food and much more! Representatives from healthcare organizations, in-patient and out-patient recovery centers, 12-step groups, and non-profit organizations, are invited to host a booth to provide information and resources to our community. Is a non-profit organization serving the community of Colorado Springs and surrounding areas. We offer a wide variety of services including information and referral, substance abuse awareness education, Recovery Coaching, sober activities and support group meetings springsrecoveryconnection.org. Is a supportive, physically active community for individuals who are recovering from a substance use disorder and those who choose to live sober. Through pursuits such as climbing, hiking, running, strength training, yoga, road/mountain biking, socials and other activities, we seek to help our members develop and maintain the emotional strength they need to stay sober. www.phoenixmultisport.org. One of the most important aspects of the Springs Recovery Rally is to connect recovery services and resources with people who are looking for hope in Colorado Springs! Your presence at the Rally as an exhibitor will make a diffeence. It is also a great place to network! Booth space is available for 50/ organization and includes one 6-foot table and 2 chairs. Your organization, along with a short description of what you do, will be listed below. We will also include your contact information on our Resources handout at the Rally. booth placement at the Rally is done on a first-come, first-served basis. If you wish to have your organization's logo featured on our t-shirt or any other Rally promotion, please visit our Sponsorship page. Thanks to our 2016 Exhibitors! The Foundry Treatment Center provides an opportunity for lasting recovery through our integrative body, mind and spirit treatment program. Comfortably located in Steamboat Springs, Colorado in the majestic Rocky Mountains, The Foundry provides a safe and natural setting that encourages instinctive growth for the individual as they forge a new life in their own vision. Cedar Springs Hospital has been compassionately treating children and adults for more than 90 years. Our mission is to deliver the highest quality of services to individuals and their families who are dealing with the ramifications of mental illness and/or substance abuse issues. Assessments and referrals are available 24/7 free of charge. Call: 1-800-888-1088. Triple Peaks Recovery and Serenity Peaks Recovery Centers are gender specific, extended care alcohol and substance abuse treatment programs for young adults, ages 18-30. Located in beautiful Colorado Springs, Peaks Recovery Centers integrate a variety of individual, group, and trauma therapies to treat both substance abuse issues and many co-occurring mental health issues. Our six-month PHP/IOP program followed by our three-month OP program setting, allows each individual within our program to incrementally move forward in their recovery. Our programs are favorably structured for young adults and specifically designed to promote long term recovery in an accountable, communal setting. We provide a continuum of care. This means that we offer programming for every level of addiction treatment and provide ongoing support. We are committed to helping to establish quality recovery, while cultivating fun and adventure as part of the healthy pursuit of a life worth living. Services provided include Detox, Residential Treatment, Day Treatment, IOP and Therapeutic Sober Living Homes. Facilities and programs are located in Colorado, New Mexico and Utah. AspenRidge Recovery offers both IOP services as well as 90-day in-house care. We afford people the tools to live successful and sober lives while utilizing the latest evidence-based therapeutic methods in a safe, accountable community setting. AspenRidge embodies an approach wherein addiction and alcoholism are treated with the Twelve Steps in tandem with various mental health and trauma therapies. Additionally, we recognize that family and community systems are impacted by addiction. Therefore we aim to treat peripheral issues in conjunction with the client's immediate needs. Sandstone Care is a treatment program for young adults ages 18-30 and adolescents ages 13 to 18 struggling with substance use and co-occurring disorders in both Denver and the Broomfield/Boulder area. Sandstone Care offers a full continuum of outpatient care including Extended Care, Day Treatment, and Intensive Outpatient programs and takes a systemic approach in providing academic and vocational support, weekly family participation, initial evaluation and follow-up with our psychiatrist and dietitian, weekly community-based activities, and evidence-based group and individual therapy. At Mayfield Counseling, we know situations can occur in our lives that make it difficult to find a positive resolution. Relationship issues, parenting stress, anxiety, and depression can easily distract us from finding hope. We want to encourage and empower you to enjoy life and achieve your full potential. Clarity - Hope - Purpose. The Recovery Village at Palmer Lake: TRVPL is a 58 bed, full continuum of care facility located 15 minutes from Colorado Springs and an hour from the Denver International Airport. TRVPL treats patients struggling with addiction, substance abuse and co-occurring disorders in a luxurious 40,000 square foot facility nestled in the foothills of the Colorado Rockies. We have an exceptional trauma program for those needing a highly specialized treatment experience. We utilized multiple treatment modalities, especially EMDR and RRT. Grace and St. Stephen's Episcopal Church has been part of the fabric of Colorado Springs for more than a century. As part of our understanding of what it means to be a downtown church, we are committed to joining with our community to end homelessness by addressing its many causes including addictions. We are a founding member of Ecumenical Social Ministries, host families who are homeless through the Interfaith Hospitality Network of Family Promise, serve in the Lord’s Supper ministry at Sacred Heart Catholic Church, and host a weekly AA meeting for women. To begin the registration process please select one of the following sponsor fees. Premier Sponsorship (Sold Out) - ,500: Includes introducing keynote speakers, name/logo featured on the event website, printed on all publicity and t-shirts (largest space on t-shirt), complimentary booth space, and 10 complimentary registrations for the Phoenix Multisport Run/Walk for Recovery. Gold Sponsorship (Sold Out) - ,500: Includes name/logo featured on the event website, printed on all publicity and t-shirts, complimentary booth space, and 5 complimentary registrations for the Phoenix Multisport Run/Walk for Recovery. Silver Sponsorship (5) - 00: Includes name featured on the event website, printed on all publicity and t-shirts, complimentary booth space, and 2 complimentary registrations for the Phoenix Multisport Run/Walk for Recovery. 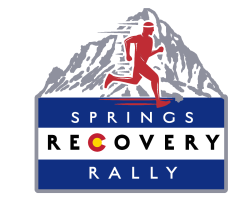 The Springs Recovery Rally is FREE! You do not need to register to attend. Registration is required, however, for the Race and if you want to volunteer. Please use the links below to register. Is a non-profit organization serving the community of Colorado Springs and surrounding areas. We offer a wide variety of services including information and referral, substance abuse awareness education, Recovery Coaching, sober activities and support group meetings springsrecoveryrally.org. At Mayfield Counseling, we know situations can occur in our lives that make it difficult to find a positive resolution. Relationship issues, parenting stress, anxiety, and depression can easily distract us from finding hope. We want to encourage and empower you to enjoy life and achieve your full potential. Clarity • Hope • Purpose. The Recovery Village at Palmer Lake:TRVPL is a 58 bed, full continuum of care facility located 15 minutes from Colorado Springs and an hour from the Denver International Airport. TRVPL treats patients struggling with addiction, substance abuse and co-occurring disorders in a luxurious 40,000 square foot facility nestled in the foothills of the Colorado Rockies. We have an exceptional trauma program for those needing a highly specialized treatment experience. We utilized multiple treatment modalities, especially EMDR and RRT. Grace and St. Stephen’s Episcopal Church has been part of the fabric of Colorado Springs for more than a century. As part of our understanding of what it means to be a downtown church, we are committed to joining with our community to end homelessness by addressing its many causes including addictions. We are a founding member of Ecumenical Social Ministries, host families who are homeless through the Interfaith Hospitality Network of Family Promise, serve in the Lord’s Supper ministry at Sacred Heart Catholic Church, and host a weekly AA meeting for women. To learn more about our sponsorship opportunities and fees, Click the 'Sponsor Fee' tab above. Premier Sponsorship (2) - ,500: Includes introducing keynote speakers, name/logo featured on the event website, printed on all publicity and t-shirts (largest space on t-shirt), complimentary booth space, and 10 complimentary registrations for the Phoenix Multisport Run/Walk for Recovery. Gold Sponsorship (2) - ,500: Includes name/logo featured on the event website, printed on all publicity and t-shirts, complimentary booth space, and 5 complimentary registrations for the Phoenix Multisport Run/Walk for Recovery. Silver Sponsorship (10) - 00: Includes name featured on the event website, printed on all publicity and t-shirts, complimentary booth space, and 2 complimentary registrations for the Phoenix Multisport Run/Walk for Recovery.